According to most experts, the U.S. is still growing. However, some experts like [ECRI's] Lakshman Achuthan and [SocGen's] Albert Edwards argue that the U.S. is in a recession. But Riccadonna and the economics team at Deutsche Bank have an incredibly reliable indicator of recessions. 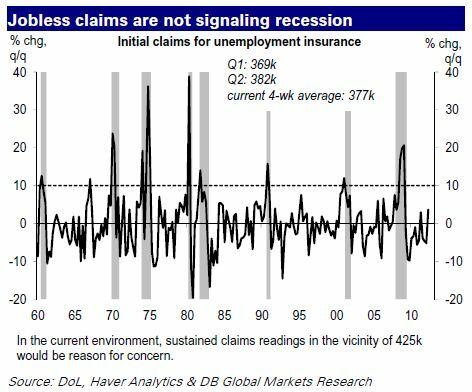 Our rule of thumb is as follows: In the past, when jobless claims backed up by 10% or more from the prior quarter’s average, in all but one instance (Q1 1967), the economy was on the brink of recession. Thus, the rule has proven to be fairly reliable over the past several decades. So based on the recent quarter's average jobless claims and the current trend of jobless claims, Riccadonna notes that that "rule of 10%" would suggest we are not heading into recession. Riccadonna's and Ro's conclusion is unwarranted. As I explained in a series of tweets, I don't know if we are currently in a recession or not, but Riccadonna's chart is not really useful to assess that at all. The reason is simple. Riccadonna and Ro already acknowledge that the above indicator incorrectly predicted a recession in 1967. However, they didn't notice that the chart failed to predict the start of the 2008 recession using their 10% threshold. If you look closely at the above chart, you will notice that at the time the 2008 recession began (or when the economy was "on the brink of recession"), the indicator was up ~5% q/q (a dip from a slightly higher number in the prior quarter), much less than the 10% q/q threshold cited by Riccadonna. It only rose to ~10% some months into the recession. So, the use of the 10% threshold by Riccadonna is incorrect and artificial. The correct threshold would be closer to ~5% - and if we use that threshold, the chart is revealed as basically not that useful because it would have predicted a recession in many more years that were not recession years. Not to mention the indicator is close to the ~5% q/q threshold right now.